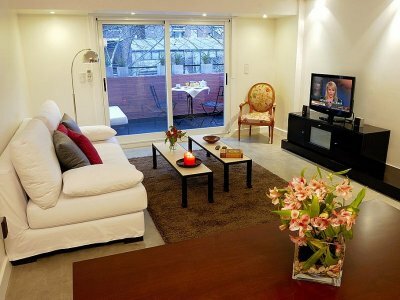 Contemporary first class DUPLEX perfectly located in the exclusive and elegant district of Palermo Chico. On a quiet street, with beautiful trees and little traffic, this top-end duplex flat is located just half block away from a well-maintained grassy park (Plaza Alemania). 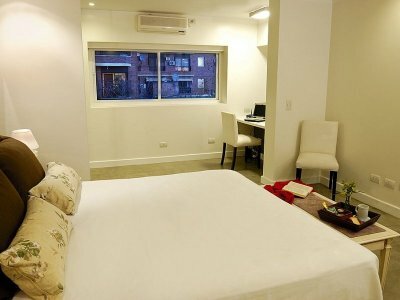 It is within walking distance from the worldwide known Latin American Art Museum (MALBA), famous Museo Renault restaurant, Paseo Alcorta shopping mall, and Figueroa Alcorta Ave. which gives you access to all parts of the city. This exclusive residential area of Palermo is surrounded by elegant mansions, museums, embassy buildings and parks and plazas. Palermo Chico, is the wealthiest part of Palermo. Many rich and famous personalities own their homes there. This cutting edge newly restored and stylishly decorated duplex apartment is on the 8th floor, has a beautiful balcony with huge windows that offer plenty of light to the whole property. One the first level, the living room and kitchen are divided by only the kitchen bar, leaving this space open wide, and perfect for dining or entertaining. As you head up the wooden staircase, the bedroom and bathroom follow the same design. The spacious duplex offers all the comforts of home with Wi-Fi internet access, LCD plasma TV, air conditioning and cleaning service. - LIVING ROOM WITH DINING AREA: stylish living area with custom-design furniture, includes a sofa-bed (0.90 x 1.90), coffeetable, armchair, 32'' LCD TV. The dining area consists of an original wood table with four chairs. Air conditioning. Access to the balcony. 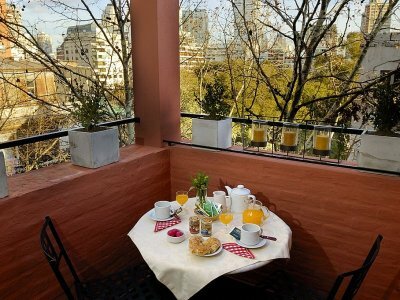 -PRIVATE BALCONY: large balcony with beatiful outdoor furniture. Open green views. 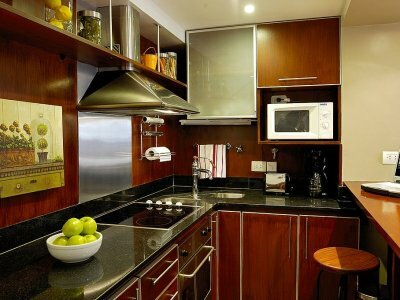 - KITCHEN: Gorgeous modern and open kitchen, fully equipped; fridge with freezer; microwave, electric toaster, coffemaker, four-burner stove, and oven. 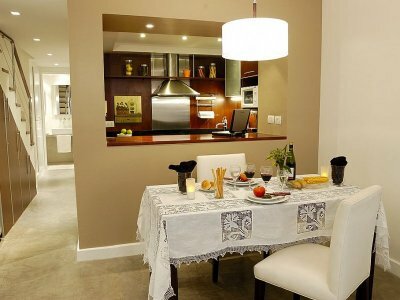 There is ample silverware, glasses, and cooking utensils for entertaining up to six people. 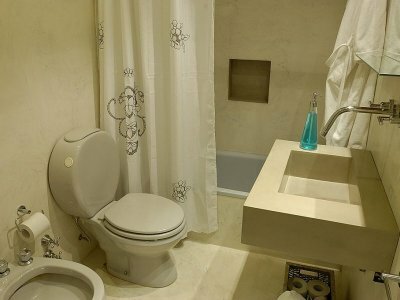 - GUEST BATHROOM: near the entrance there is a guest toilette. 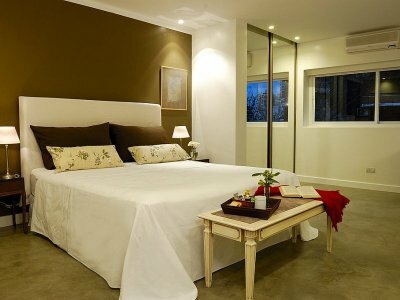 - MASTER BEDROOM ENSUITE: large bedroom full of light equipped with a king-size bed (1.80x 2.00 mts) convertible into two twin-size beds. Ample closets, bed-side cabinets and lamps. Blackout curtains. 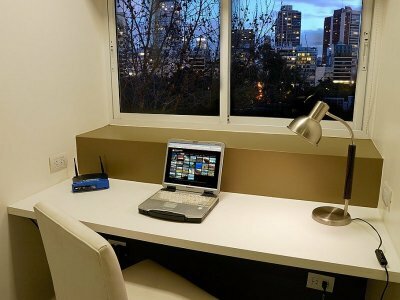 There is an office area with a wood desk and a comfortable chair, free Wi-Fi broadband internet access available. Air conditioning. Complete ensuite bathroom. - BATHROOM: complete with bathtub and shower. Modern style. Hair dryer. This is a non-smoking unit. Smokers are kindly requested to smoke outside on the terrace. Published prices are final. You pay exactly what you see published plus an administrative fee of $40 USD. These rates are final in USD; they include: building expenses, local phone calls (control line for limited local calls), cable TV, electricity, water, gas, Wi-Fi high-speed internet access, cleaning service once a week and taxes. 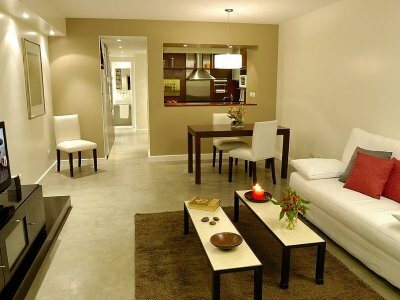 Please note: Special rates from December 20th to January 5th are higher for this apartment.